The public view of plastic surgeons has always been something along the lines of those featured in TV shows like Nip/Tuck or Dr. 90210. It’s time to clear up all of those stereotypes out there. 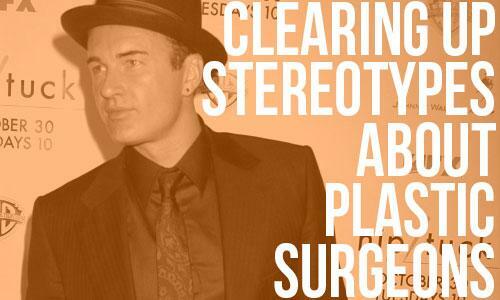 Public opinion has begun to stereotype plastic surgeons as rock stars of the medical field based on Hollywood portrayals. The life of a real-life plastic surgeon is not about fancy cars and dating beautiful woman – it’s about the patient. In order to become a plastic surgeon, you are required to go through years and years of schooling followed by additional years of training and residency. One common misconception is that people become surgeons strictly for the money. The reality is, the majority of surgeons are there because of the positive impact that they can make on their patients’ lives. Unfortunately, that premise just wouldn’t make for good television nowadays. Also, the patients that we work with are far from the way Hollywood chooses to portray them as well. Most patients come to a plastic surgeon as a means to improve low self-esteem by addressing an area of discomfort such as uneven breasts or the extra skin leftover after pregnancy or weight loss. Plastic surgery is by far one of the most competitive medical fields to break into and only some of the best certified physicians make it to this position. Surgeons certified by the American Society of Plastic Surgeons have gone through some of the most intensive training to achieve the level of experience necessary to perform the various cosmetic procedures. These procedures are designed to benefit the lives of the patients and help to instill a sense of self-confidence.